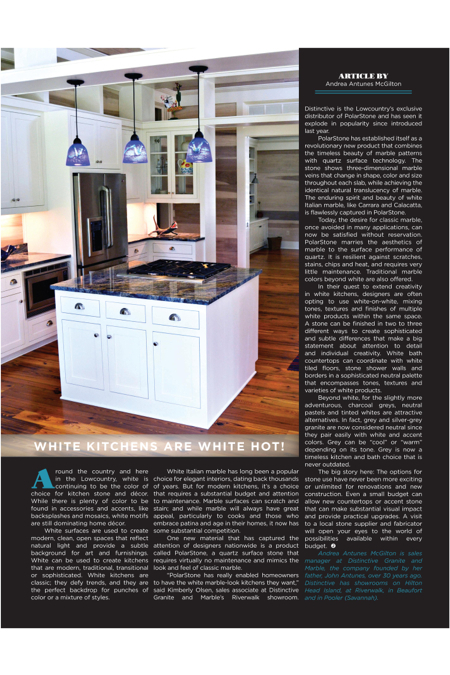 Hilton Head Magazines: CH2/CB2: White Kitchens are White Hot! Around the country and here in the Lowcountry, white is continuing to be the color of choice for kitchen stone and décor. While there is plenty of color to be found in accessories and accents, like backsplashes and mosaics, white motifs are still dominating home décor. White surfaces are used to create modern, clean, open spaces that reflect natural light and provide a subtle background for art and furnishings. White can be used to create kitchens that are modern, traditional, transitional or sophisticated. White kitchens are classic; they defy trends, and they are the perfect backdrop for punches of color or a mixture of styles. White Italian marble has long been a popular choice for elegant interiors, dating back thousands of years. But for modern kitchens, it’s a choice that requires a substantial budget and attention to maintenance. Marble surfaces can scratch and stain; and while marble will always have great appeal, particularly to cooks and those who embrace patina and age in their homes, it now has some substantial competition. One new material that has captured the attention of designers nationwide is a product called PolarStone, a quartz surface stone that requires virtually no maintenance and mimics the look and feel of classic marble. “PolarStone has really enabled homeowners to have the white marble-look kitchens they want,” said Kimberly Olsen, sales associate at Distinctive Granite and Marble’s Riverwalk showroom. 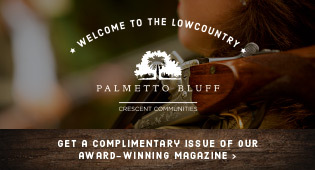 Distinctive is the Lowcountry’s exclusive distributor of PolarStone and has seen it explode in popularity since introduced last year. PolarStone has established itself as a revolutionary new product that combines the timeless beauty of marble patterns with quartz surface technology. The stone shows three-dimensional marble veins that change in shape, color and size throughout each slab, while achieving the identical natural translucency of marble. The enduring spirit and beauty of white Italian marble, like Carrara and Calacatta, is flawlessly captured in PolarStone. Today, the desire for classic marble, once avoided in many applications, can now be satisfied without reservation. PolarStone marries the aesthetics of marble to the surface performance of quartz. It is resilient against scratches, stains, chips and heat, and requires very little maintenance. Traditional marble colors beyond white are also offered. In their quest to extend creativity in white kitchens, designers are often opting to use white-on-white, mixing tones, textures and finishes of multiple white products within the same space. A stone can be finished in two to three different ways to create sophisticated and subtle differences that make a big statement about attention to detail and individual creativity. White bath countertops can coordinate with white tiled floors, stone shower walls and borders in a sophisticated neutral palette that encompasses tones, textures and varieties of white products. Beyond white, for the slightly more adventurous, charcoal greys, neutral pastels and tinted whites are attractive alternatives. In fact, grey and silver-grey granite are now considered neutral since they pair easily with white and accent colors. Grey can be “cool” or “warm” depending on its tone. Grey is now a timeless kitchen and bath choice that is never outdated. 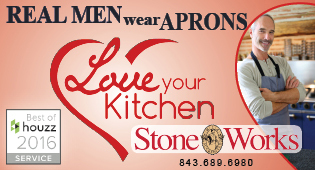 Andrea Antunes McGilton is sales manager at Distinctive Granite and Marble, the company founded by her father, John Antunes, over 30 years ago. 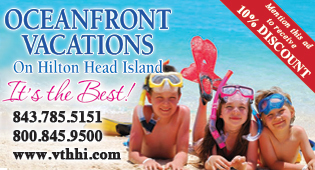 Distinctive has showrooms on Hilton Head Island, at Riverwalk, in Beaufort and in Pooler (Savannah).